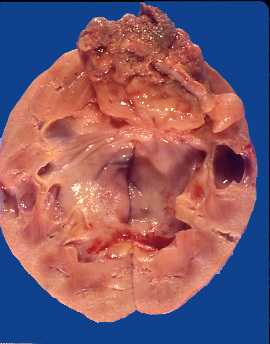 This and other cases can be accessed by visiting our Home Page at www.PathologyOutlines.com and clicking on the Case of the Week button on the left hand side.� To view the images or references, you must click on the links in blue.� Links in green are to journals with free full text-no registration. In September, we will attend the Beaumont Hospital DNA Conference in Troy, Michigan and the CAP Annual Meeting in Chicago.� In October, we will attend the Wayne State University annual conference in Dearborn, Michigan and the ASCP Annual Meeting in New Orleans.� Conference information for all but CAP is on our Conferences page (or click here).� If you will be attending any of these conferences, stop by our booth and say hello. 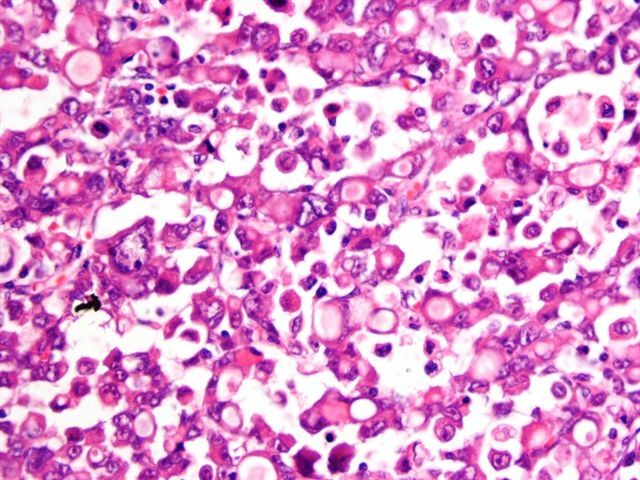 We thank Dr. Juan Jos� Segura Fonseca, Departamento de Patolog�a, Hospital San Juan de Dios, San Jos�, Costa Rica, for contributing this case and the discussion.� To contribute a Case of the Week, please email info@PathologyOutlines.com with attachments of microscopic images (any size, we will shrink if necessary) in JPG, GIF or TIFF format, a clinical history, your diagnosis and any other images (gross, immunostains, etc.) that may be helpful or interesting.� We will write the discussion (unless you want to), list you as the contributor, and send you a check for $35 (US) for your time after we send out the case.� Please only send cases with a definitive diagnosis. 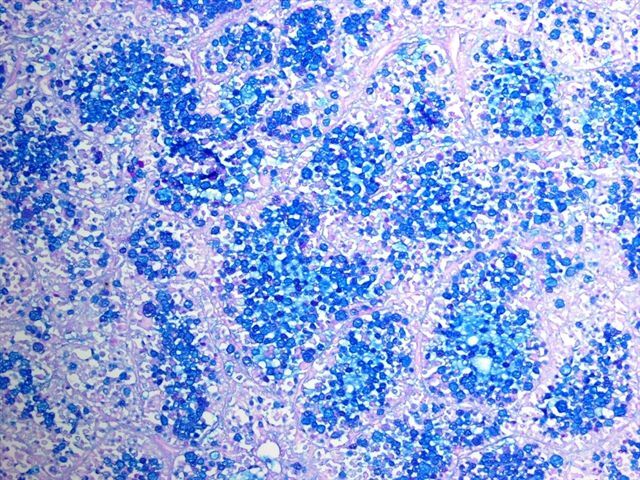 Microscopy showed numerous cells with pink, rhabdoid features and abundant intracytoplasmic lumina (Figure 3).� Some areas were composed almost entirely of signet-ring cells (Figure 4) that demonstrated abundant intracytoplasmic mucin with the PAS-Alcian-blue stain (Figure 5).� No areas of urothelial (transitional cell) carcinoma were identified. 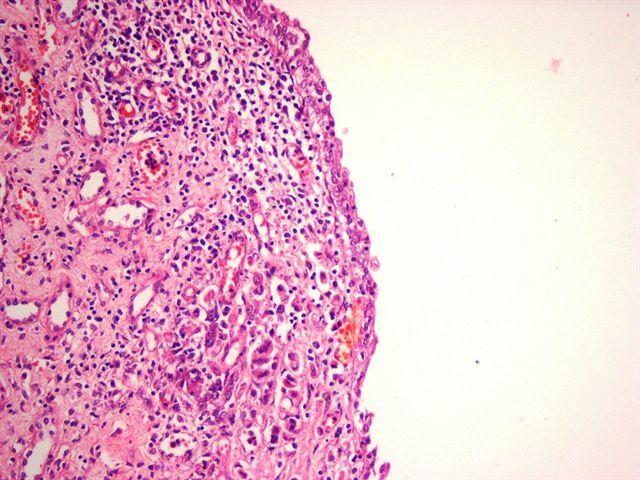 There was also severe chronic inflammation of the renal pelvis with atrophic urothelium and superficial invasion by tumor cells (Figure 6), as well as superficial goblet cell metaplasia of the urothelium (Figure 7). 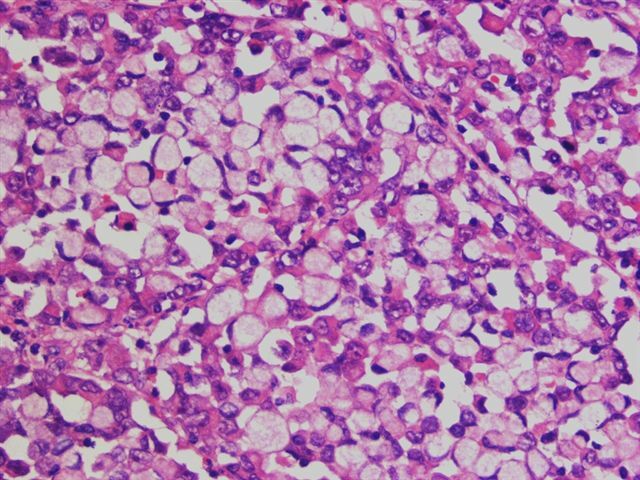 Primary neoplasms of the renal pelvis are rare, and account for 7% of all renal tumors.� Most are urothelial (transitional cell) carcinomas (1-3). 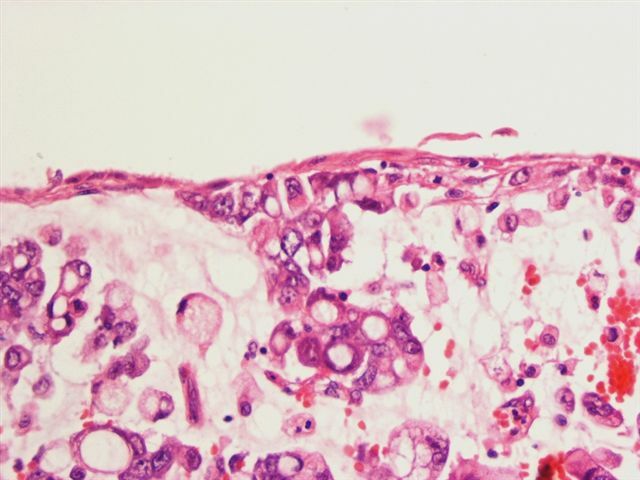 �The urothelium can display a wide variety of differentiation and metaplastic changes, particularly in high-grade neoplasms. �These changes have been described in detail in the urinary bladder (4), but are less well known in the renal pelvis. Mucinous carcinomas are usually large, infiltrating tumors which fill a dilated renal pelvis and calyces, and invade the adjacent renal parenchyma (7-10).� The signet ring pattern is rare (9), and may be associated with collagenous spherulosis (11).� Intestinal, mucinous, cystitis cystica and goblet cell metaplasia of the urothelium, present in this case, have been implicated as precursor lesions (12). 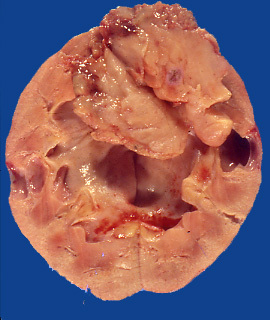 The differential diagnosis includes high grade urothelial carcinoma, which may show foci of signet rings (3), and the rare lipoid-cell variant of urothelial carcinoma (13).� The signet ring cells in both variants are mucin negative, and the tumors also have areas of usual type high grade urothelial carcinoma.� Metastases from the stomach, breast or other organs must also be ruled out. 12.� Raghavendran M, Rastogi A, Dubey D, et al. Stones associated renal pelvic malignancies. �Indian J Cancer 2003;40:108.